Anytime you need to disturb the ground, it’s wise to find out what’s buried and exactly where it is. Landscaping, fencing, and excavation of any kind runs the risk of cutting an underground service, which can result in loss of service, property damage or injury. Manitoba alone has over 50 utility companies with buried assets. 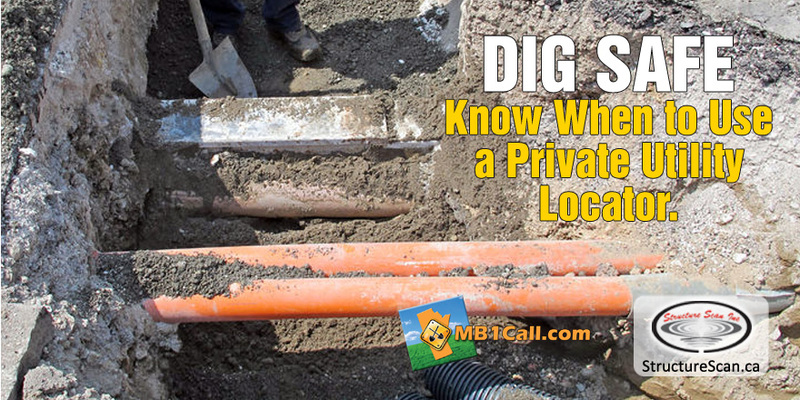 Residential homeowners may receive adequate information by contacting the utility companies directly, or by using the free call before you dig service. It’s important to know, the free utility locating call centre is not local to Saskatchewan or Manitoba. Also, each utility company has its own schedule and may not arrive when you expect. In addition, not all utilities participate in the free service and some will not locate their service on private property, such as Sewer and Water. Commercial construction projects require proof of thorough due diligence in utility discovery. This usually means a combination effort of, acquiring documentation from the property owner, contacting the major utilities, privately locating and possibly the use of Ground Penetrating Radar (GPR). Damage Prevention is everyone’s responsibility, be sure and be safe.